If you were hoping that Google Glass would be a passing fad, you might be disappointed to hear that it looks like the category of wearable facial devices is only getting started. Wearable technology has been a hot topic at D11, and while there has been a lot of talk about physical products — glasses, wristbands — one company is focusing on how we interact with them. Atheer, a Mountain View, Calif.-based startup, today unveiled its mobile 3-D platform for wearable devices. Using a combination of stereoscopic 3-D and augmented reality technology, the company envisions users simply having to swipe their hand or flick their finger to navigate through menus or launch apps, all without ever having to touch a physical screen. 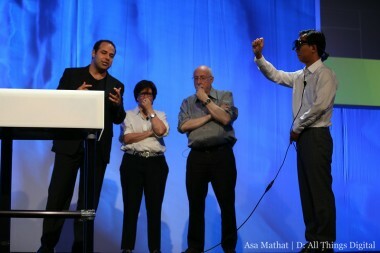 Atheer founder and CEO Soulaiman Itani and CTO Allen Yang joined AllThingsD’s Walt Mossberg and Kara Swisher onstage to show off how the technology works using a pair of glasses. To be clear, Atheer isn’t a hardware product but the platform to power such wearable devices as glasses, bands or whatever else might come our way. In the demo, Itani and team showed off a handful of apps they developed for Atheer. While they built the apps using Android (because it’s open source), Itani said they are developing the platform so it can work with any operating system or any piece of hardware. 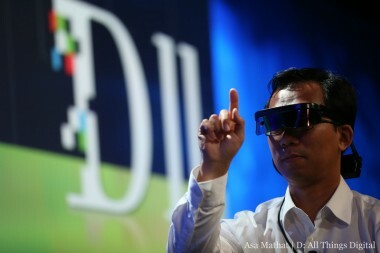 In one example, Yang rotated a virtual 3-D globe by moving his finger in the air. All the info is overlaid into the user’s field of vision, so you can still see what’s going on in the real world around you. In another example, Yang picked up a virtual newspaper and flipped through the pages with a series of gestures. But what was interesting is that the images were all in 3-D. If you’ve ever seen or read the Harry Potter series, it’s like the newspapers they have at Hogwarts. Jets were flying off the page. By touching an ad for a grocery store, a bunch of fruit came popping off the page where you could slice them (a la Fruit Ninja style), and as a reward for engaging with the ad, a coupon appeared for a discount at the same store. Atheer certainly isn’t the first to use 3-D or augmented reality in wearable devices. Oculus Rift and Epson are using similar technology, but Itani said Atheer’s use of natural gestures and personalization sets them apart from the competition. “I think what they’re doing is great. For us, it’s just another piece of validation. Epson is going there. Google is going there. It’s very exciting, and we’re very happy to be a part of it,” Itani said. But while the tech industry might be onboard, what about the rest of the world? In a pre-interview, I asked Itani if he thought the general public was ready to accept wearable devices. Atheer plans to start engaging with developers within the next couple of months, and hopes to power wearable devices on the market next year. Itani, who has a PhD from M.I.T. in electrical engineering and has done cancer research at Stanford University and the University of California at Berkeley, began working on Atheer a couple of years ago as a side project. The company now has about 20 employees and has received funding from private investors, including Farzad Naimi, co-founder of RONA Holdings, and Bobby Yazdnai, chairman and CEO of Saba Software.